Another shockingly good movie! I hesitated to watch it just because I wasn't sure it would be worthwhile. Fassbender is so diverse as an actor that he can truly make any character/film come to life. He and his fellow cast mates do an excellent job at making this wicked video game come to life. If you love action and sci-fi, you will enjoy this movie. The year's best kept secret. sheer waste of your time and money on Christian's theological garbage on this movie. It is no different from actual Christian's theology like, God the Father loves the killing the Son the Jesus for mercy and salvation, illogical believes and illogical movie. Action movie of the year. Very Good Movie. I read the reviews with people complaining and thought this won't be great but I wanted to see it as soon as saw the first trailer months ago. Forget the reviews, people always complain and as for the gamer's complaining the game is better etc well you cannot make them happy anyway. It is as entertaining as you expect a good action movie to be. Go see it and ignore the reviews. Myself and my wife went and we really enjoy it as it lived up to be the movie we expected it to be. Good action, great visuals, as always a great movie experience with great sound and big screen experience. I look forward to the next one. 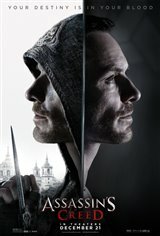 If you liked the game you might not like this movie. The only good thing about the movie was explaining the true (?) origin if the Creed, but one can get that by a Google. The extra loud music helped drown out what little dialogue there was. SUGGESTION - Save your money. I had limited knowledge of the game before watching the movie however the stunts were woundefully done. The actor portraying the main character did a very good job of it. My only qualm with the movie was getting use to the varying timelines. Amazing movie! I only know a little bit about the games but I understood it and epic I'd go see it again.